We have all seen the pictures. The desperation in the faces of children yanked from their parents. 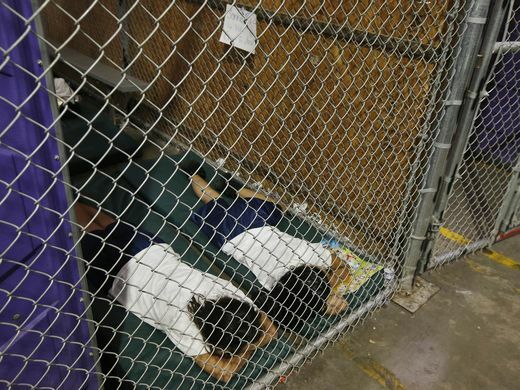 Countless children laying on cots in metal cages. 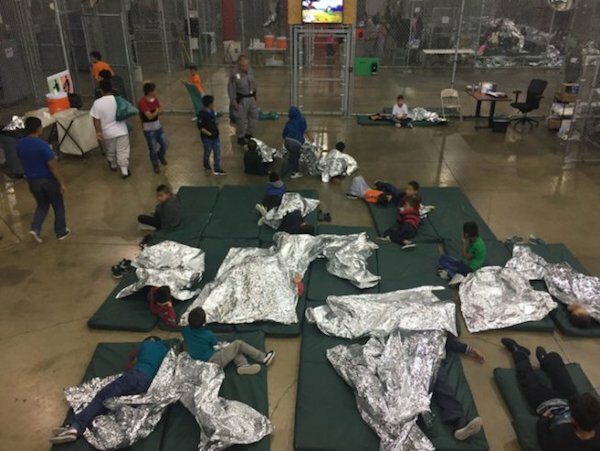 The living conditions of the kids in this “detention centers” look more like jails or even concentration camps housing underage kids, many of them babies and toddlers. AP has even highlighted situations such as kids having to change babies’ diapers and toddlers being forced to “settle down” by security guards. The guards are trained as police, not as childcare providers, and they have absolutely no proper training or capacity to deal with children. Meanwhile, the kids are not provided with anything to occupy their attention, like toys or books. According to Chief of Staff John Kelly, these horrific actions against poor, oppressed, and exploited migrants are to be a “tough deterrent” against crossing the border. Acting with “zero tolerance” against defenseless children goes further than the already unjust and inhumane immigration policies. It has nothing to do with any semblance of “democracy.” These acts are criminal acts against humanity that must end now. The images of children kept in cages remind us of the worst moments of human history: slavery, when children were sold away from their parents; Native American boarding schools, where children were taken to “civilizatory camps”; and concentration camps. The separation of children from their parents has occurred throughout U. S. history; this is just a current iteration of the U.S.’s racist and brutal policies. The pain and suffering these children are currently undergoing is in this sense not a break with a just or democratic America but an escalation and continuity of U.S. policies. The U.S. bombs and tortures abroad on a regular basis. It has killed and displaced millions in the name of “human rights”. As we all watch the government separate children from their parents, the U.S. democratic facade has once again fallen away for the world to see its true light: racism, sexism, oppression and cruelty. When the news of the separation of children from their parents first broke, the first images to emerge of children locked away were not from this year but rather from the Obama administration. Obama deported more undocumented immigrants than any President to date and locked up children in similar conditions to those of the Trump administration. Obama officials obviously had very elaborate explanations. Trump blames the current situation on old laws passed by the Democrats, claiming he is only enforcing them with “zero tolerance.” He wants to use the migrant children and their misery as a bargaining tool to get the wall he promised his constituents. The Democrats and their anti-immigrant policies certainly deserve some of the blame. In fact, in the midst of this human rights catastrophe, Democratic Senators such as Kamala Harris, have taken the time to appear on CNN to defend the actions of ICE. It’s no wonder. The Democrats also defend the police after each and every police assasination of black youth. The Democrats and Republicans are united in their defence of the repressive mechanisms of capital— of ICE and of the police. They agree that the U.S. must “defend the border” when really all they want to defend is the capitalist system. It’s a system that needs repressive forces to defend itself and its disgusting injustices. It’s a system that allows the top one percent of the population to hoard 43% of the wealth while 80% of the population only share 7% of the wealth. Capitalists profits from the free movement of goods from maquilas, where workers make less than five dollars a day, to American stores where workers hardly make a living wage. Although goods can move freely, people die in the desert trying to cross the border, and when they do, families are divided and children are locked up in prisons. When migrants are able to make it into the US, it’s to work minimum wage jobs with little to no protections against abusive bosses. It’s again— to guarantee capitalist profits. The ruling class that benefits from our misery can’t exist without repressive forces that, ultimately, act as bodyguards of the wealth of the elite and their political lackeys. This is what politicians from both parties are really trying to hide. That they represent the class that profits from the pain and suffering of millions. Many immigrants are taken to private prisons which profit off of long detentions for migrants; some profit off of the detention of children. Other organizations, such as SouthWest Keys Program make massive profits as well. 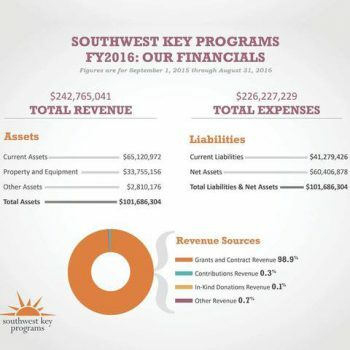 Southwest Keys, a company based 98.9% based on government contracts makes 240 million in yearly revenue. This model of for profit prisons, social services and for profit wars characterizes American society. Profit is the motor, but it is driven by racism and xenophobia. Immigrants from Latin America are used as a scapegoats for the anger and frustration people feel towards a society that is unable to resolve basic human necessities such as housing, health care, education, and living wages. The US government has once again shown that the Republicans and Democrats are both to blame for the policies that do nothing more than protect the wealthy and the corporations at the expense of the workers, the poor and the oppressed. The Democrats will now tour the centers they helped create and make media declaration to gain an electoral advantage in the upcoming elections, but our anger must be directed against them as well. Both parties have enabled each other and have dragged society into what will be remembered as one of the darkest moments in the history of the US and the world. In response, we must make clear that no human being is illegal. Immigration is our right, is not a crime. The massive outcry around the country against these horrible policies demonstrates that Trump’s policies do not reflect the national mood towards immigrants. While a small portion of the population does echo the xenophobic propaganda, the great majority of American workers and the American population still rejects this inhumane treatment. It’s high time for another massive immigrants rights movement, in the spirit of the 2006 Day Without an Immigrant, which organizes with the incredible weight of immigrants and our allies in the US economy. We need strikes by all immigrants and all those who support immigrants rights to impose an end to the separation of families, to the deportations and to reactionary institutions such as ICE. We need to fight so that no families are separated— not by ICE, not by Trump’s border wall and not by any border.